Brake Hose for Morris Minor. Hose fits both front and rear on the Sedans, Tourer, and Travellers. Hose only fits the front on the LCVs. 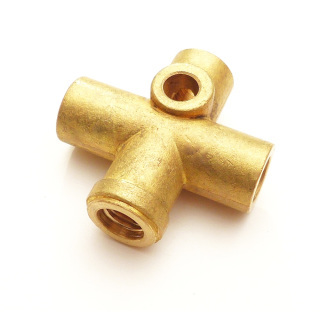 Mounted on the differential of the rear axle, this brass union connects the chassis hose from the master cylinder to the two brake pipes that go out to the rear wheel cylinders at the wheels. Because of it's exposed location this fitting is often in very bad condition, or you may want to replace it if you can't get a bad brake line out of it. Over tightening of the rear brakes pipes can cause the inside flares to get damaged. The seal on the pipes and hose is critical for good braking. Threads are 3/8" BSF. Replace this if you are not sure of its past life.